Preliminary results from the 2018 Juvenile Striped Bass Seine Survey, conducted by researchers at the Virginia Institute of Marine Science (VIMS), suggest an average year class of young-of-year striped bass was produced in Virginia tributaries of the Chesapeake Bay in 2018. The survey recorded a mean value of 10.72 fish per seine haul in the Virginia portion of Chesapeake Bay, which is similar to the historic average of 7.77 fish per seine haul. The 2018 year class consists of juvenile striped bass that were hatched this spring. 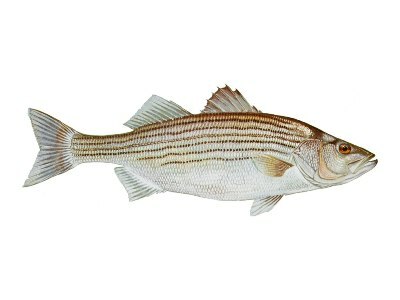 If not claimed by natural mortality, the young striped bass can reach catchable sizes in three to four years. The 2018 recruitment index was also similar to indices observed in the past five years. Although there can be considerable variation in striped bass recruitment among years, the average indices observed in recent years suggests that abundance of juvenile striped bass has been stable. The VIMS Juvenile Striped Bass Seine Survey currently samples 18 index stations in the Rappahannock, York, and James River watersheds. Biologists sampled each site 5 times from late June to early September in 2018, deploying a 100-foot seine net from the shore. Each fish captured in the net is counted, measured, and returned to the water. These young striped bass usually measure between 1.5-4 inches long. Survey scientists in Virginia measured 1,875 juvenile striped bass at these stations in 2018. VIMS has been conducting the survey annually since 1967 for the Virginia Marine Resources Commission (VMRC). The Maryland Department of Natural Resources (DNR) conducts a similar survey in the northern portion of the Bay. The striped bass population in the Chesapeake Bay has rebounded from historic lows in the late 1970s and early 1980s, after fishing bans were enacted in Delaware, Maryland, and Virginia in the mid- to late-1980s. Since then, the population has increased to the point that striped bass in the Bay and elsewhere are now considered recovered.